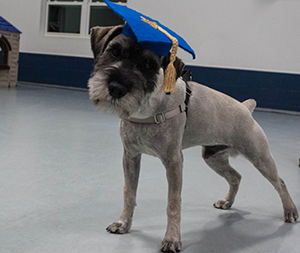 After completing our Sophomore Basic Manners Class, you can continue your dog’s education through this Advanced Obedience Class. Here, we will work around tougher distractions, focus on new commands such as “place” and “touch,” develop a more reliable recall, and begin off leash work. How much happiness does your dog bring to you? Have you ever thought about sharing that joy with hospitals, nursing homes, and the community? All you have to do is pass a simple training test and your dog can bring his wagging tail to many in need of a smile! This prep class will help you and your dog master each step of the test. What is Therapy Dog International? This 6 week class includes orientation and 5 weeks of learning how to be a good puppy! Pups will begin learning sit, down, stay, loose leash walking, recall, polite greetings, play do’s and don’ts and much, much more. Do you have a dog who needs a refresher course? A new addition to the house? A dog who is now a teenager and forgot what they learned in puppy school? A dog who listens at home, but not in public? For dogs ages 6 months and up, this 6 week class includes orientation and 5 weeks of learning. Dogs will learn sit, down, stay, loose leash walking, recall, polite greetings and more – all with distractions added to help good behaviors stick! Please fill out the training application and our trainer will contact you! Hotel Office closed No pickups or drop-offs Staff will be here to care for the pets Grooming Salon closed Daycare closed Park closed No training classes HAPPY EASTER EVERYONE!